Manufacturer: ThermoPro. Item model number: TP06S. The ThermoPro TP-03A is an effective solution to achieve the most accurate temperature in a matter of seconds. Do NOT leave in an oven. - Probe Length: 3.8" food grade stainless steel probe. 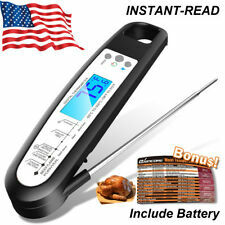 - Unique Fast Reading system achieves an accurate temperature reading within 4 - 7 seconds. Set your own temperature settings manually 2. Probe and Wire can withstand up to 716Ã‚Â°F (380Ã‚Â°C) 3. Receiver pullout counter top stand; Receiver belt clip 6. Transmitter has wire to either hook on oven door or use as a stand 7. 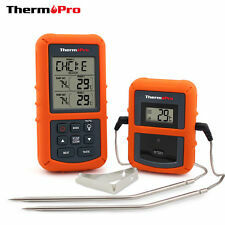 Thermo Pro Digital Food Thermometer. Condition is New. Manufacturer: ThermoPro. Batteries: 1 AAA batteries required. (included). Can also set temperature manually. Manufacturer: ThermoPro. Features: do not touch hot probe or wire with bare hands during or just after cooking. Always wear a heat-resistant glove. Item model number: TP-16. Manufacturer: ThermoPro. Includes USDA preset temperatures and can also adjust set temperature manually. Item model number: TP-17. Batteries: 1 AAA batteries required. (included). Probe Length: 3.8" food grade stainless steel probe. • Probe Length: 8.5" food grade stainless steel probe and 3" oven/bbq stainless steel probe. Probe and Wire can withstand up to 716F (380C). 8.5” food grade stainless steel food probe and 3” oven/BBQ probe are both able to quickly and precisely calculate your exact temperature. 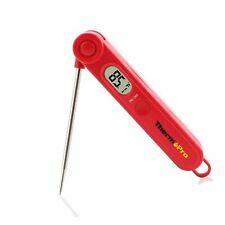 ThermoPro TP17 Digital LCD Meat Food Thermometer Dual Probe Cooking Thermometer. Condition is New. Shipped with USPS First Class Package. Please look at pictures of actual item as part of description. Thanks for looking at our auctions. Always reach your preferred level of doneness. Never burn or undercook food ever again. You risk nothing. Think about the health and safety of your loved ones. With a passion for functional design and great-tasting food, we're here to help you create delicious experiences. ThermoPro TP55 -----Household essential for comfort. Besides, it also indicates the change trend of temperature and humidity. Check indoor comfort and humidity conditions at a glance with the humidity level icon. Manufacturer: ThermoPro. Smart LCD Backlit Screen shows 3 different colors in reaction to different temperature it receives. The long cable length, ensures the transmitter won't get splashed by oil or liquid. ThermoPro Digital Thermo-Hygrometer LCD Indoor Humidity Monitor Thermometer NEW. Simple Humidity Level Indicator Check indoor comfort and humidity conditions at a glance with the humidity level icon. 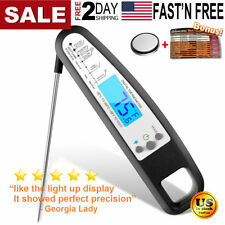 Perfect gadget for monitoring temperature and humidity, show in degrees Celsius or Fahrenheit. Probe Length: 6.5" food grade stainless steel probe and 3" oven/bbq stainless steel probe. Remote Range: Up to 300 feet. Transmitter has wire to either hook on oven door or use as a stand. Lost link alert. Probe Length: 6.5" food grade stainless steel probe. Remote Range: Up to 300 feet. Transmitter has wire to either hook on oven door or use as a stand. 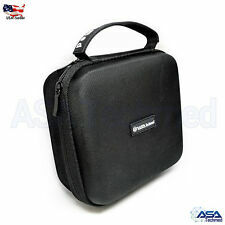 Rubber sleeve case. Probe and Wire can withstand up to 716°F (380°C)Specifications. 【1 YEAR WARRANTY! ThermoPro TP-03A is an effective solution to achieve the most accurate temperature in a matter of seconds. Do NOT leave in an oven. Cook like a pro! Have the temperature next to you and you will know when the bbq is done. Do not expose plug of probe or plug-in hole to any liquid, which will result in a bad connection and faulty readings. With these preset settings, the TP06S is the ideal kitchen assistant for an inexperienced cook! Probe Length: 6.5" food grade stainless steel probe. Certifications: CE certified, RoHS, FDA approved probe. The long cable length, ensures the transmitter won't get splashed by oil or liquid. Smart LCD Backlit Screen shows 3 different colors in reaction to different temperature it receives. Large, smart backlit LCD display that changes color during the cooking process (blue->green->red). Smart LCD Backlit Screen shows 3 different colors in reaction to different temperature it receives. The long cable length, ensures the transmitter won't get splashed by oil or liquid. Perfect On The Grill or Smoker For Flipping Racks of Ribs, Chicken, Hot Dogs, etc. You will need a suitable adapter to use the item in your country. Certain restrictions apply. An adult signature will be required.